Graffiti-lined walls featuring lyrics from hip-hop songs welcome visitors to New York’s Center for Architecture, currently exhibiting “Close to the Edge: The Birth of Hip-Hop Architecture.” On view through Jan. 12, the exhibit showcases installations, completed buildings and proposed developments, façade studies, and academic work, to provide evidence for the existence and significance of hip-hop architecture, as influenced by the musical genre and cultural movement. 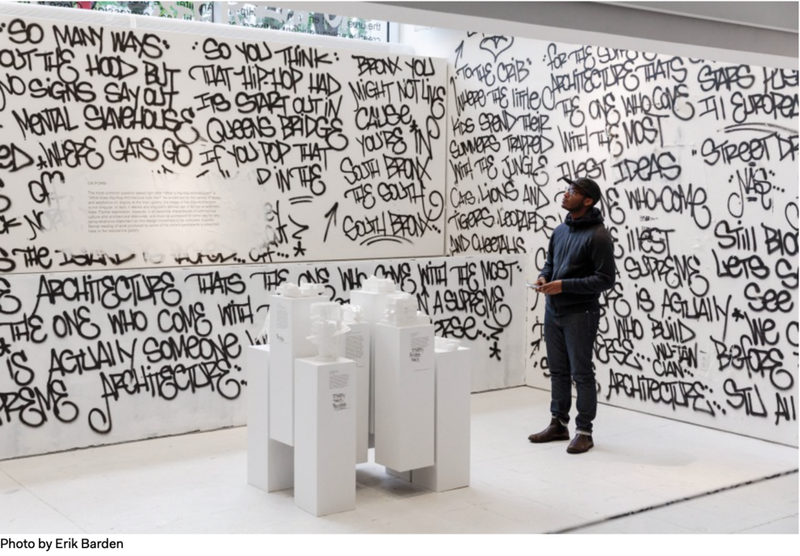 "We’re uncovering examples of people creating art, understanding, and changing the built environment using hip-hop as their primary lens," exhibit curator and designer Sekou Cooke says. Beginning with a brief history of hip-hop and its key means of expression—deejaying, emceeing, b-boying, and graffiti—"Close to the Edge" features work by 21 artists, designers, students, and professors including hip-hop architecture theorist and University of Michigan architecture lecturer Craig Wilkins; hip-hop architecture camp founder Michael Ford; and prominent 1980s graffiti artist Boris “Delta” Tellegen. "Hip-hop, the dominant cultural movement of our time, was established by the Black and Latino youth of New York’s South Bronx neighborhood in the early 1970s," an introductory panel reads. "Some 25 years in the making, hip-hop architecture is finally receiving widespread attention within the discipline of architecture." With graffiti tagging by famed artist Chino as a backdrop, much of the featured work is mounted on repurposed shipping containers. Exhibit highlights include a public housing brick façade designed by Delta in Haarlem, Netherlands, in 2013; Cooke's own "3D Turntables: Remixing Hip-Hop Architectural Technology;" and work by St. Paul,–Minn. based 4RM+ULA founder, James Garrett Jr., AIA. A new exhibit, “Close to the Edge: The Birth of Hip-Hop Architecture” is on view at the Center for Architecture in New York until Jan. 12.